To book online, click on the Reserve button above. Round trip transportation on a deluxe motor coach. Visit to the icewine festival in Twenty Valley area of Niagara. Over 30 local wineries and over 80 wines under one roof. Please note that tokens much be purchased to try the wines and food being offered. Tokens are not included in the tour price. We will be there during the official opening ceremony of the icewine festival, the Vogue In The Valley Fashion Show and Chef Danny Smiles Cooking Demonstration. High tea at the Prince of Wales Hotel in Niagara-On-The-Lake. Tour and tasting at Chocolate F/X, a choclate factory and retail outlet near Niagara-On-The-Lake. $95 per person. HST extra. 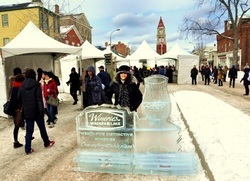 You will have about 2 hours to wander Queen St., try the assorted ice wines and delicious ice wine flavoured munchies being offered by the various wineries in their tents and in general, enjoy the quaint and unique atmosphere of Niagara-On-The-Lake in winter. Please note that there is a cost for the wine tastings from the winery tents and you will need to purchase tokens and an official tasting glass from the tickets tent before you can be served anything from the winery tents. And finally we end up at our last stop, our dinner in a very elegant and upscale restaurant with cuisine inspired by Tuscan cooking. Set in a beautifully restored old winery building overlooking Butler's creek, like in an Italian trattoria, you’ll experience an invigorating and lively atmosphere. We leave at approximately 9:00 AM. Actual pickup times vary by stop and will be sent out in the final email to all registered attendees, 2 days before the trip. Sorry but this trip is restricted to adults 21 and older.